I’m about as ill-equipped as I ever am to take pen in hand, even as my typewriter keys get gummed up with my own mental whitewash…soon after we published a post about Staaltape in October 2012, three more Staaltape cassette tapes arrived 17 January 2013, presenting the same enigmatic puzzles – anonymous packages, hand-written information, blank imagery. At first coup d’oeil, it’s hard to know what to even call the items by name, as the titles and artists are far from clear. There are lots of layers to the packages, like layers of semiotic meaning, and it takes patience to even get to the cassettes through pieces of tissue paper, rubber bands, inserts, masking tape and such. 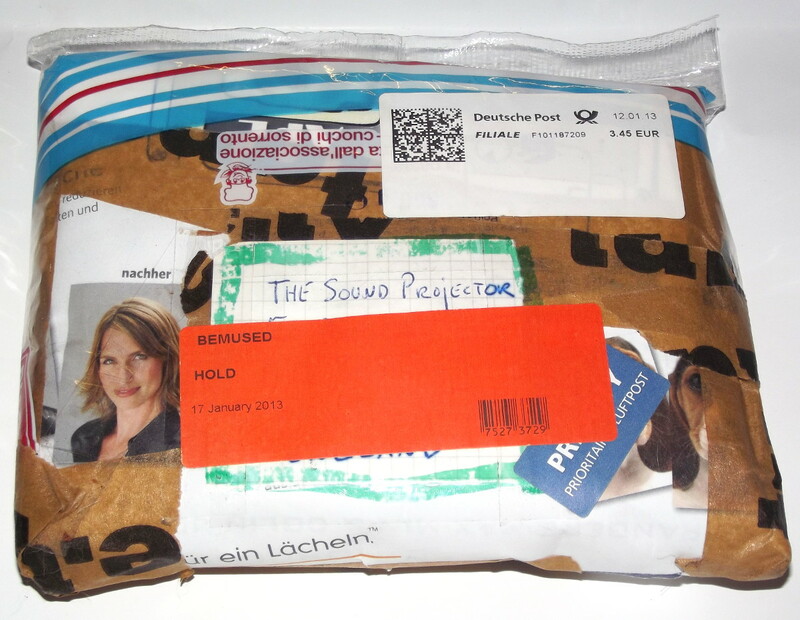 And once again the parcel itself is wrapped up in a strange collage made by the label owner Rinus Van Alebeek. I am suitably bewildered already. So let’s take the cassette Zanstones Für Berlin first of all. The cover is hand-painted with poster paint with the letter S, because every copy had one of the title’s letters on the cover, so if they were all laid out in a shop or gallery I suppose it would spell itself out. As fate would have it, it’s already in its second (small) edition of 18 copies. The American audio artist Zan Hoffman had a show called Zanstones held at Staalplaat Berlin in 2011, and he gathered all the sounds on this tape in a single day. The little pictures printed on this piece of Kodak Extralife paper don’t really explain very much about that process, though some of them they show him in the open air in that city pointing his microphones in unusual places, including up towards a municipal traffic light. The late Hugh Davies made sound recordings of different types of pedestrian crossings across the world; I think he was a connoisseur in that area. This cassette is a fairly puzzling audio experience too. I ought to start off saying it is fascinating to listen to and in places has a primitive beauty that is almost incandescent (especially the eerie, insistent drones on side two). But it’s eccentric and strange too. It’s quite some way from the usual things that city-dwelling field recordists bring us back from the city when they create their well-meaning but ultimately rather boring documentary snapshots. By contrast, Zanstones Fur Berlin is full of highly surprising incident, and amounts to some sort of day-dreaming, ambulatory episode – the recognisable sounds we hear always being undercut or overlaid with very non-familiar things. Hoffman has found a world within a world, or else he doesn’t live in the same place as most normal men. It’s a portable audio installation, a tour around a private art gallery. He somehow remakes the world into his own private space and beholds everything with wonder. The strangest elements on this tape are provided by Hoffman’s muttering, chanting and whispering voice, which cloaks everything in mystery. It might be possible to read these utterances as aural captions for the vitrines in this aural art exhibit. It’s as though we’re having the outside world explained to us by a certifiable madman, speaking urgently in his own private language. Then it dawns on us that he’s not mad at all. The label regards this recording as a surrealist journey, and I’m all for that. Now we have an item clipped in a shiny black box. On the front is a murky image which I take to be an x-ray of a spinal column. The interior is disguised as an old Sacha Distel tape on a budget label. This AudioZine #1: Glenn Branca item is the work of Rinus Van Alebeek, who composed the A side ‘City Of Music’ using location recordings from New York City – there are numerous edits and strange treatments, including some echo and backwards tapes perhaps, and the music of Glenn Branca may appear here also. Spoken word elements there be, isolated remarks from an American companion (playing Virgil to Van Alebeek’s Dante), leaking into the chaotic and vivid sounds of the gigantic metal monster that is NYC. What a living breathing creature he transforms it into. I sometimes wonder why other “artistic” field recordists tend to produce such dead documents of the environment: sedate, minimal, almost inhuman in their clinical beauty. Then you hear an ugly but vital document like this one, almost scary in the way it depicts and totally embraces the raw and bleeding inhospitality of modern urban life. This is not a question of looking among “the garbage and the flowers”, but allowing yourself to be run over by an entire fleet of garbage trucks and very possibly eaten alive by the giant rats of Manhattan. From these edits and treatments, there emerges a glorious roar of abstract noise which makes you glad to be alive. On the B side we have further recordings from Paris, New York and Washington D.C.; for parts of these aural journeys, Van Alebeek is assisted by Harold Schellinx and Emmanuel Rebus. Schellinx is an important creator (musician, writer and artist) from the Dutch underground who played in post-punk bands in the 1970s, and has been creating sonic diaries for about 13 years with his portable Walkman recorder and tiny mic clipped to his jacket lapel. This side is largely more straightforward and non-composed, it includes a long (bootleg-quality) recording of Glenn Branca’s guitar music being played at a venue and we also eavesdrop on a conversation between an American (probably Branca himself) and our European friends; some of this has been used as raw material for the A side. Branca’s contribution is such that he even has his own name loosely inserted in the release on a small piece of orange paper. Would he appreciate being visually compared to Sacha Distel? N.B. : I wrote the above without knowing the actual story, which is here. The last item is titled Groetjes Uit Brussel and features contributions from four Belgian sound artists – Flavien Gillié, Jean Jacques Duerinckx, Margarida Guia and the strangely-named Patate. The artistic brief handed down to them was to “depict one moment or fragment of the town they live in”. They came up with these lovely miniaturist statements which glisten like a jewel for precious seconds, then vanish in a drifty manner. I don’t know a great deal about these Belgians although Duerinckx appears to be a jazz saxophonist and Margarida Guia is a performance artist / comedienne who has appeared in films and has composed radiophonic works. Of the three tapes, this one might not be as outright strange or shocking as the two items noted above, but it is extremely beguiling; the individual contributions are listed, but not divided up or signposted in the programme, and the accumulated listening experience reveals a misty and slightly warped view of the city of Brussels. Moving from shopping mall to church, we are in a highly fluid zone where even the most fleeting and banal sound has the potential to be a sign of some import. Signs are taken for wonders. We don’t know where we are or where we might be going next, and the effect is like floating through an evanescent dream-world on winged shoes, passing overheard and drifting through walls like a wispy ghost. If the aim of Van Alebeek and these artists is to create unusual maps of the world, they are succeeding. The tapes themselves are the maps, finding aids to allow us to locate our own zones of importance, and in the final analysis enabling us to perform our own personal dérives of the city. These tapes do more than just present interesting glimpses of overlooked corners of the world, they perform certain artistic operations on the mind and help us to rewire our brains.